Papa Piders Jazzband was one of the most popular traditional bands in Gothenburg in the early sixties and for 25 years thereafter. 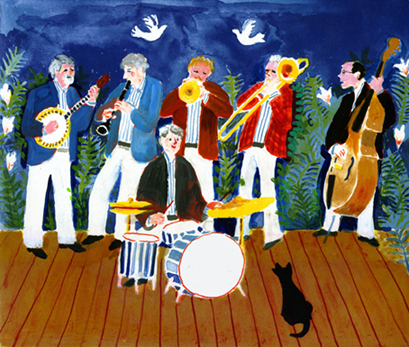 The band was an institution on the Gothenburg jazz scene, winning several competitions. Also, it was one of the first traditional jazz bands in Gothenburg to go abroad. After a long break from the mid eighties and onwards, it was time for a re-start in 2010. Initiated by Bosse Lindgren, the original Papa Pider drummer, a new constellation was formed, partly by members of the original band. Our music is the revival jazz, the way it was played during the so-called trad boom by e.g. Acker Bilk, Ken Colyer, and Chris Barber, with a lot of singing, and some skiffle. Hand-picked musicians with a long experience from the European jazz scene guarantee the high musical standard of this new band.